The Ipswich Museum offers an array of exciting lectures, exhibits and classes that are open to the public. Registration is open for winter classes in the Dow Arts Program. Click here for details. February 4- Brown Bag Lunch – theme: Sports Exhibit. Stephanie Gaskins, Dow Curator, will lead a round-table discussion about local sports history. This exhibit is in recognition of a long term interest of the late William Markos.Brown Bag Lunches are held at 12 noon on the first Monday of each month in the Heard House at 54 South Main Street. Ipswich seniors and museum members are free of charge. The cost of non-members is $5. February 20 – Postponed due to Inclement Weather until February 27th– Wednesday Evening Lecture – theme: Interior Life in 17th Century Ipswich. John Fiske will cover both meanings of “interior”: how people lived inside their houses and also how they lives inside their heads (how they thought about life, relationships, community, and religion) as they went about their daily lives. John Fiske is an antique dealer, serves on the Collections Committee at the Museum, and curated two exhibits for the Ipswich Museum, one of 17th Century seating and the other of 17th Century storage furniture. He is chair of the Ipswich Historical Commission and as past chair of the Architectural Preservation District Commission. His interior life if firmly anchored in the 17th Century. Wednesday Evening Lectures are free for museum members; $10 for non-members. Held at 7:30pm in the Heard House of the Ipswich Museum. March 4 – Postponed due to Inclement Weather, Date TBA– Brown Bag Lunch – theme: Weaving Demonstration at the Whipple House. Come learn about the barn loom that was re-assembled in the Whipple House. Weaver Diane Howe will share her knowledge of weaving and provide a demonstration. Note! This will be held upstairs at the Whipple House. Bag Lunches are held at 12 noon on the first Monday of each month. Ipswich seniors and museum members are free of charge. The cost of non-members is $5. March 20 – Wednesday Evening Lecture – theme: Back Bay Through Time. Anthony Sammarco talks about this massive land-fill project, begun in 1850, that took 3 decades to complete and create Boston’s famous Back Bay. All the marshlands west of the Boston Public Garden were filled, amounting to roughly 550 acres. The talk chronicles the neighborhood from the late 19th Century to today. Anthony Sammarco is a noted historian and author of 70 books on the history and development of his native Boston. This is his newest book. He resides in Boston and Osterville on Cape Cod. Wednesday Evening Lectures are free for museum members; $10 for non-members. Held at 7:30pm in the Heard House of the Ipswich Museum. April 8 – Brown Bag Lunch – theme: Railroads in Essex and the Role of the Railroad Shanty. Railroad enthusiasts Alan McMillan and John Stump will discuss railroad history and the acquisition by the Museum of the railroad shanty that once sat on Topsfield Road. Brown Bag Lunches are held at 12 noon on the first Monday of each month in the Heard House at 54 South Main Street. Ipswich seniors and museum members are free of charge. The cost of non-members is $5. April 17 – Wednesday Evening Lecture – theme: Newspapers of the 1780s. Brian Ditchek has researched articles in newspapers of the times from Boston, Philadelphia, and New York. His presentation will include advertisements which describe that time period along with reports of the Revolutionary War, Paul Revere, John Hancock, voting results for elected offices, the ratification of the Constitution, and more! Brian Ditchek is a researcher who loves history and has led courses on the 1780s in America at Harvard University Institute of Learning in Retirement. He presently lives in Ipswich. Wednesday Evening Lectures are free for museum members; $10 for non-members. Held at 7:30pm in the Heard House of the Ipswich Museum. May 6 – Brown Bag Lunch – theme: Sullivan’s Corner / The Last Years of the Farm. Thomas Clasby, local author and architect, has written a terrific history about Sullivan’s Corner at the junction of Mill Road and Topsfield Road. Through intense research he reconstructs the world of the farm and its surroundings. The road from Ipswich to Topsfield runs roughly east-west, about five miles from the railroad tracks at the edge of downtown Ipswich, until it meets that Newburyport Turnpike. Brown Bag Lunches are held at 12 noon on the first Monday of each month in the Heard House at 54 South Main Street. Ipswich seniors and museum members are free of charge. The cost of non-members is $5. May 15 – Wednesday Evening Lecture – theme: A Feast for the Eyes: Food in the Fine Arts. Joe Carlin, Nutritionist and Culinary Historian, explores great works of art that have food, drink, or dining as a theme. From Roman mosaics to contemporary artist Andy Warhol’s painted Campbell Soup Cans, food has always been a subject for artists to comment on cultural and social values. This presentation will highlight some of the great art found in Boston’s Museum of Fine Arts and other museums around the world. Wednesday Evening Lectures are free for museum members; $10 for non-members. Held at 7:30pm in the Heard House of the Ipswich Museum. June 3 – Brown Bag Lunch – theme: Objects from the Collection. Curator, Katherine Chaison displays and presents another popular talk about objects from the Museum’s collection that are not normally on display. Brown Bag Lunches are held at 12 noon on the first Monday of each month in the Heard House at 54 South Main Street. Ipswich seniors and museum members are free of charge. The cost of non-members is $5. June 19 – Wednesday Evening Lecture – theme: Summer Exhibit Wednesday Evening Lectures are free for museum members; $10 for non-members. Held at 7:30pm in the Heard House of the Ipswich Museum. Happy Summer! No Brown Bag Lunch or Wednesday Evening Lecture this month. September 9 – Brown Bag Lunch – theme: Discover the Tudors. Museum Educator, Kaleigh Paré takes us on her ten day tour of London, Windsor, and Stratford-upon-Avon, England. A fun historical tour of the Tudor monarchs! Brown Bag Lunches are held at 12 noon on the first Monday of each month in the Heard House at 54 South Main Street. Ipswich seniors and museum members are free of charge. The cost of non-members is $5. September 18 – Wednesday Evening Lecture – theme: Reinterpretation of 16 Elm. Bob Booth, author and storyteller, will talk about his work with the Smithsonian Institution about 16 Elm Street. New information has been uncovered about the occupants, including Chance Bradstreet, an enslaved boy who came from Marblehead; Abigail “Nabby” Dodge, who grew up there at the same time and then moved to Salem and founded a progressive school for girls; and Capt. Abraham Dodge, a merchant who was one of the captains in the Ipswich militia and later a colonel on the Rebel army. He led his men to Bunker Hill and fought there in June 1775. Robert Booth is a researcher, historian, and spellbinding storyteller who lives in Marblehead, MA. He has written a number of historical books, his latest being: The Women of Marblehead, a Illustrated Feminist History of Marblehead in the 19th Century. Wednesday Evening Lectures are free for museum members; $10 for non-members. Held at 7:30pm in the Heard House of the Ipswich Museum. October 7 – Brown Bag Lunch – theme: Clementine Churchill. Suzanne Kiley, who gives a series of talks on historical figures fro the Explorers Lifelong Learning Institute will share her knowledge of Clementine Churchill. Clementine was her husband Winston Churchill’s closest adviser, although her influence on his was not recognized during her lifetime. She never sought praise for her many public achievements including gaining American support for Britain in WWII. She was known for her hearty laugh, and her trendsetting sense of style has been compared to Jackie Kennedy. Brown Bag Lunches are held at 12 noon on the first Monday of each month in the Heard House at 54 South Main Street. Ipswich seniors and museum members are free of charge. The cost of non-members is $5. October 16 – Wednesday Evening Lecture – theme: The Ocean Liner that Switched Sides. During WWI, he biggest ship ever built, the Leviathan, outraced German U-boats to deliver more than 100,000 US troops to France. Ipswich writer, Doug Stewart traces the ship’s origins as the Vaterland, a German luxury liner seized at a New York ock the day the US declared war on Germany. Stripped of its finery and converted to a troop carrier, the enormous ship became the centerpiece of American wartime “bridge of ships.” Ipswich Magazine writer Doug Stewart has published a number of stories on military and maritime subjects, including that of the Vaterland/Leviathan. Wednesday Evening Lectures are free for museum members; $10 for non-members. Held at 7:30pm in the Heard House of the Ipswich Museum. November 4 – Brown Bag Lunch – theme: Immigration Story. Curator, Katherine Chaison will share stories from her time in Greece last summer working with the Yazhide survivors of the 2015 genocide. Brown Bag Lunches are held at 12 noon on the first Monday of each month in the Heard House at 54 South Main Street. Ipswich seniors and museum members are free of charge. The cost of non-members is $5. November 20 – Wednesday Evening Lecture – theme: Neighborhood Talk. Stephanie Gaskins explores another street in Ipswich fro a memorable journey to a new neighborhood. Wednesday Evening Lectures are free for museum members; $10 for non-members. Held at 7:30pm in the Heard House of the Ipswich Museum. No Brown Bag Lunch or Wednesday Evening Lecture this month. January 7 – Brown Bag Lunch – theme: Herself and Molly. Sydell and Arnold Rabin share stories from their new book that illustrates the struggles and joys of people searching for love and understanding within the complexity of human relationships. Arnold Rabin spent his early years as a writer and producer/director for television networks and the United Nations. He has written plays, short stories, a grammar book for adults, two children’s books, and a novel. Sydell Rabin has been a freelace writer, writing consultant, and president of her own company call The Writing Associates. She has been a department head of English and has written two books. One book helps teachers prepare students for state testing and the other helps mothers of the groom redefine their roles. Brown Bag Lunches are held at 12 noon on the first Monday of each month in the Heard House at 54 South Main Street. Ipswich seniors and museum members are free of charge. The cost of non-members is $5. January 16 – Wednesday Evening Lecture – theme: Historic House-A Labor of Love. Architect, Mat Cummings of Cummings Architects will speak on the subject of historic houses and how to properly restore while modernizing them. His goal is to always maintina the houses’s integrity while at the same time provide wonderful essentials for everyday living. 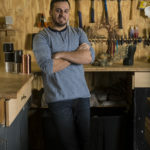 Mathew Cumings has restored countless houses ranging from some of the oldest First Period structures in the area to stately Victorians in Greater Boston. His firm has won local and national awards for preservation and design, notable among them include: Centre Farm, Lynnfield (c. 1785), the Day Dodge House, Ipswich (c.1737), and the Knowlton House, Ipswich (c. 1725). Wednesday Evening Lectures are free for museum members; $10 for non-members. Held at 7:30pm in the Heard House of the Ipswich Museum. November 5- Pastor Deborah Knowlton has studied primary sources and uncovered the names and partial histories of nearly 150 African-American men, women, and children who lived in the Hampton, NH area. Her book Color Me Included, is the the result of a three year historical and spiritual search as she transcribed clergy records from the Archives of the First Congregational Church. Brown Bag Lunches are held at 12 noon on the first Monday of each month in the Appleton Room in the Heard House at 54 South Main Street. Ipswich seniors and museum members are free of charge. The cost of non-members is $5. November 14- Neighborhood Talk: Old Argilla Road Speaker: Stephanie Gaskins, Ipswich Museum’s Dow Curator will take us on another sentimental journey, sharing stories about the Argilla Road neighborhood. This is a popular lecture with guests in attendance taking us down memory lane. Free for museum members; $10 for non-members. Held at 7:30pm in the Heard House of the Ipswich Museum. December 1st, 9am-3pm Holiday Boutique Ipswich Museum’s annual Holiday Boutique featuring Grandma’s Attic (well-loved, upscale items), handmade arts & crafts, food items, local artists selling their crafts. The Heard House will be decorated for the season. Admission is free. October 1- Beekeeping As A Hobby Susan Russell: Ipswich Museum Volunteer, will share her stories of beekeeping, including successes and surprises. Brown Bag Lunches are held at 12 noon on the first Monday of each month in the Appleton Room in the Heard House at 54 South Main Street. Ipswich seniors and museum members are free of charge. The cost of non-members is $5. October 17– The Myths & Legends of Ipswich Speaker: Town Historian, Gordon Harris will share myths and legends, along with old ghost stories that may have new twists. His web site contains a number of responses that people posted about their own experience or legend. Free for museum members; $10 for non-members. Held at 7:30pm in the Heard House of the Ipswich Museum. October 20 – Haunted House Open 6-8pm during Ipswich Illuminations. October 26 – Family Halloween Party 3-5pm Join us in the courtyard of the Heard House for fall fun! Costumes are encouraged. The cost per child is $5/members and $7/non-members. Caregivers are admitted free. 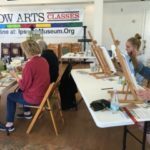 Registration for Fall Dow Arts classes is now open! New classes are still being added so check back often. Spaces are starting to fill, so sign up now! In collaboration between Ipswich Museum and Birth to Three, young children will uncover the magic of museums in a fun interactive way, combining early literacy and socialization. Enjoy story time on the stairs, looking activities in the gallery rooms, followed by art making. Developed for 3 year olds, each session will focus on a particular part of the collection, an exhibit, or a seasonal theme. (Age 3) (Wednesdays, 10:30-11:30am) Participants must register with Birth to Three! September 10 – Dreaming of Italy Speaker: Linda Dini Jenkins, is the author of Up At The Villa: Travels with my Husband and she often blogs about her travel experiences. Their tours involve experiencing local food and wine, learning writing and photography skills with a unique focus on historical adventures in Italy’s small towns and countryside. Brown Bag Lunches are held at 12 noon on the first Monday of each month in the Appleton Room in the Heard House at 54 South Main Street. Ipswich seniors and museum members are free of charge. The cost of non-members is $5. September 19- Ipswich and Its Board of Selectmen Speaker: Jim Engel ( former Selectmen and Ipswich Water Commissioner )will focus on the Board of Selectmen as the principal governing body of the Town of Ipswich tracing the Board’s history from the earliest days through to current times emphasizing the changing role of the Board over time. Prominent selectmen both notable and notorious will be highlighted. Free for museum members; $10 for non-members. Held at 7:30pm in the Heard House of the Ipswich Museum. 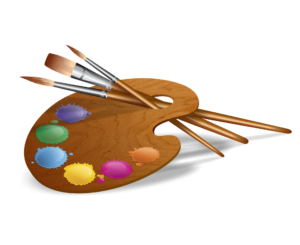 Registration for Fall Dow Arts classes is now open! New classes are still being added so check back often. 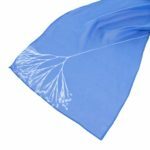 The first class of the fall is a Sunprint Scarf Workshop on August 25th. Spaces are starting to fill, so sign up now! No Brown Bag Lunch or Wednesday Evening Lecture this month. Happy summer! Whipple Wednesdays! Every Wednesday morning in July and August, 10am-noon. Join us in the yard by the Whipple House every Wednesday morning in July and August for colonial games and tours of the herb garden. There’s no need to make a reservation or stay the whole time; just drop in. We’ll have a variety of historic games to play, including rolling hoops, graces, fox & geese, and more! This is a free, all-ages program, but donations are appreciated. Sold Out – August 11th, 6-8pm From the Author to My Husband, a play about the life of Ann Bradstreet. Performed by 4 actors from History Alive in Salem, depicting the 4 stages of Ann Bradstreet. The show will take place inside the Whipple House, showing her life in England, Salem, Cambridge, Ipswich, and Andover. Seating will be set up in the downstairs. Admission is $24 per person and half price for students and members. Sold Out – August 25th, 6-8pm From the Author to My Husband, a play about the life of Ann Bradstreet. Performed by 4 actors from History Alive in Salem, depicting the 4 stages of Ann Bradstreet. The show will take place inside the Whipple House, showing her life in England, Salem, Cambridge, Ipswich, and Andover. Seating will be set up in the downstairs. Admission is $24 per person and half price for students and members. Growing in the Garden: a weekly family program. Monday mornings, July 9th through August 27th, 10am-noon, families are invited to explore the gardens at the Ipswich Museum. Each week participants will make and take home a different garden project, learn about what is growing in the gardens, and play games. Space is limited and registration is required, email educator@ipswichmuseum.org by the Wednesday before each session. Cost is $10/child or maximum $20/family. Whipple Wednesdays! Every Wednesday morning in July and August, 10am-noon. 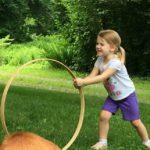 Join us in the yard by the Whipple House every Wednesday morning in July and August for colonial games. There’s no need to make a reservation or stay the whole time; just drop in. We’ll have a variety of historic games to play, including rolling hoops, graces, fox & geese, and more! This is a free, all-ages program, but donations are appreciated. No Whipple Wednesday on July 4th. July 14th, 6-8pm From the Author to My Husband, a play about the life of Ann Bradstreet. Performed by 4 actors from History Alive in Salem, depicting the 4 stages of Ann Bradstreet. The show will take place inside the Whipple House, showing her life in England, Salem, Cambridge, Ipswich, and Andover. Seating will be set up in the downstairs. Admission is $24 per person and half price for students and members. July 28th, 6-8pm From the Author to My Husband, a play about the life of Ann Bradstreet. Performed by 4 actors from History Alive in Salem, depicting the 4 stages of Ann Bradstreet. The show will take place inside the Whipple House, showing her life in England, Salem, Cambridge, Ipswich, and Andover. Seating will be set up in the downstairs. Admission is $24 per person and half price for students and members. June 4- Artifacts Discovered Speaker: Roland Arguin who is an amateur archeologist will share interesting stories on his discoveries of various items on the North Shore. Brown Bag Lunches are held at 12 noon on the first Monday of each month in the Appleton Room in the Heard House at 54 South Main Street. Ipswich seniors and museum members are free of charge. The cost of non-members is $5. June 9th 6-8pm From the Author to My Husband, a play about the life of Ann Bradstreet. Performed by 4 actors from History Alive in Salem, depicting the 4 stages of Ann Bradstreet. It will begin in the garden and move through the two downstairs rooms of the Whipple House, showing her life in England, Salem, Cambridge, Ipswich, and Andover. Seating will be set up in the two downstairs rooms. Admission is $24 per person and half price for students and members. CANCELED – June 10th 4pm Dow Arts Program Open House. Learn about class offerings. Artwork on display from this year’s classes. Created by adult and child students. Art in the Carriage Barn. No Wednesday Evening Lecture this month. Happy Summer! June 22nd– Opening Reception of Summer Exhibit Focusing on Ipswich, Photographs by Ipswich Artists.Heard House, 5:30 to 7:30 pm. SOLD OUT – June 23rd, 6-8pm From the Author to My Husband, a play about the life of Ann Bradstreet. Performed by 4 actors from History Alive in Salem, depicting the 4 stages of Ann Bradstreet. The show will take place inside the Whipple House, showing her life in England, Salem, Cambridge, Ipswich, and Andover. Seating will be set up in the downstairs. Admission is $24 per person and half price for students and members. May 7-The Butterfly Meadow Speakers: Paula Jones and Barbara Monahan of the Ipswich Garden Club will use a slide presentation to explore the transformation of a piece of land on the historic North Green into a butterfly meadow. This garden provides a central town setting for a meadow of native, waterwise, flowering plants, and grasses. They have employed organic methods and materials to attract and support beneficial pollinators and butterflies. Their presentation will focus on some of the Meadow’s plants that you might like to grow. The colorful palate of plants have attracted butterflies, pollinators, birds, naturalists and townspeople. Brown Bag Lunches are held at 12 noon on the first Monday of each month in the Appleton Room in the Heard House at 54 South Main Street. Ipswich seniors and museum members are free of charge. The cost of non-members is $5. May 16-The Byrd Expedition of ’29-30 Speakers: Maisie Crowther, Lisa Crockett and Susie Glessner will talk about the locals who participated in this expedition. They will share stories and slides about their relatives Eddie Goodale, and Freddie Crockett, along with Norman Vaughan and Victor Czecka who were involved in this expedition. It is an interesting story, in light of subsequent studies in the Antarctic. Free for museum members; $10 for non-members. Held at 7:30pm in the Heard House of the Ipswich Museum. April 1st – Closed for Easter. The exhibit will be open on Saturday, March 31st 1-4 as usual and then resume normal hours the following weekend. April 2 – Ipswich Sustainable Education Speakers: Amy Borgman and Nicole Whitten will discuss the Generation Growers program for schools.This is an exciting new program to bridge generations and lifestyles. The effort seeks to bring older adults in the community together with our youth by encouraging them to work together on the challenges and rewards of a common garden. Brown Bag Lunches are held at 12 noon on the first Monday of each month in the Appleton Room in the Heard House at 54 South Main Street. Ipswich seniors and museum members are free of charge. The cost of non-members is $5. April 4th- Volunteer Appreciation Party, Wednesday April 4th from 5 to 7pm. April 18– Pleasure Grounds: Public Gardens Close To Home Speaker: Gail Anderson lives in Ipswich and has been photographing these gardens for 10 yrs. Join her on her armchair tour of 5 public gardens with important history and significant horticultural elements. Meet the ladies and gentlemen who created them. Gardens covered in the lecture include: Glen Magna Farms, Danvers; the Sedgwick Gardens at Long Hill, Beverly; the Crane Estate at Castle Hill, Ipswich; the Stephens Coolidge Place, North Andover; and Fuller Gardens, North Hampton, NH. Free for museum members; $10 for non-members. Held at 7:30pm in the Heard House of the Ipswich Museum. Sunday, April 29th 2:00pm performance by Ipswich Moving Company: Immigration Stories – Dancing our History The performance will be approximately twenty minutes in length. Four portraits of Ipswich residence come to life through dance in a series of poignant solos performed by Janet Taisey Craft, Jenny Carlson, Danielle DiVito and Tabitha Rodger. Drawing from the ethnic traditions represented in the Museum’s Immigration Stories of Ipswich, the Ipswich Moving Company end the program with a dance montage of traditional dance styles. Adrienne Howard, who most recently performed in the Ipswich Moving Company’s production of “Pooka in the Woods”, accompanies the dances with her beautiful music on fiddle, mandolin, and the unique sound of the hurdy-gurdy. From February through April, the Ipswich Museum is hosting a series of events in conjunction with the Immigration Stories of Ipswich exhibition. Admission for special exhibit events is $10/person; this includes exhibit admission. Winter 2018 Dow Arts Program. Some workshops begin in March; check the Dow Arts Program page for details. The Dow Arts Program offers children and adults hands-on interactive experiences in the visual arts. The program brings together local artists to inspire and teach drawing, painting, photography, crafts, and the study of architecture linked to Ipswich’s historical past. March 5 – The story of Lizzy Borden- Did she do it? Speaker: Historian, James Miele will speak about Lizzy Borden who was accused and eventually acquitted for the brutal deaths of her father and stepmother in Fall River, MA in 1892. Brown Bag Lunches are held at 12 noon on the first Monday of each month in the Appleton Room in the Heard House at 54 South Main Street. Ipswich seniors and museum members are free of charge. The cost of non-members is $5. POSTPONED due to Inclement Weather Volunteer Appreciation Party, Wednesday, March 7th from 5 to 7 pm. Rescheduled for April 4th from 5 to 7pm. March 11th 1-4pm – early-St. Patrick’s Day Party. Join us for family activities celebrating Irish culture, including music, dance, games, storytelling, and more. The highlight of this celebration will be a performance by dancers from the New Hampshire Irish Step Dance School at 2pm! From February through April, the Ipswich Museum is hosting a series of events in conjunction with the Immigration Stories of Ipswich exhibition. Admission for this special event is FREE! March 25th, 1-4pm – Greek Independence Celebration. Join us for an all ages celebration of Greek culture, including music, dance lessons, storytelling, and more. Dances start at 2:30pm. From February through April, the Ipswich Museum is hosting a series of events in conjunction with the Immigration Stories of Ipswich exhibition. March 28– The Great Lawrence Textile Strike Speaker: Robert Forrant is a Distinguished University Professor, Co-Director, Senior Research Fellow @ UMASS Lowell. In 2016 he was honored for his outstanding contributions in research, teaching and public history projects in the community. He was the first professor from the College of Fine Arts, Humanities & Social Science to receive the university’s highest faculty honor since the awards inception in 2008. Professor Forrant will talk about the strike with a focus on the role the immigrant worker played in the city of Lawrence, before, during, and after the walkout. Free for museum members; $10 for non-members. Held at 7:30pm in the Heard House of the Ipswich Museum. Brown Bag Lunch on Monday, February 5th at noon, Unseen Objects from the Museum Collection. Join museum curator Katherine Chaison as she shares objects from the Museum’s collections that are not usually on display. Brown Bag Lunches are held at 12 noon on the first Monday of each month in the Appleton Room in the Heard House at 54 South Main Street. Ipswich seniors and museum members are free of charge. The cost of non-members is $5. Winter 2018 Dow Arts Program. Some workshops begin in February; check the Dow Arts Program page for details. The Dow Arts Program offers children and adults hands-on interactive experiences in the visual arts. The program brings together local artists to inspire and teach drawing, painting, photography, crafts, and the study of architecture linked to Ipswich’s historical past. Wednesday Evening Lecture AND Opening Night for Winter Exhibit: on February 21 Join us at 6pm to explore the winter exhibit, Immigration Stories of Ipswich. Then at 7:30 Immigration Exhibit Roundtable Discussion. A group of local townspeople will share some of their personal stories. Free for museum members; $10 for non-members. Held in the Heard House of the Ipswich Museum. Brown Bag Lunch on Monday, January 8th at noon, Ipswich Municipal Water System. Former Selectman and Ipswich Water Commissioner, Jim Engel, talks about the history of the water system from its inception to the current day: the physical system, water sources, treatment facilities, and distribution network, consumption statistics through the year, and a brief outline of the fiscal aspects of the department. Brown Bag Lunches are held at 12 noon on the first Monday of each month in the Appleton Room in the Heard House at 54 South Main Street. Ipswich seniors and museum members are free of charge. The cost of non-members is $5. Wednesday Evening Lecture on January 17th at 7:30 The History of the New England Tavern. Nutritionist and Culinary Historian Joe Carlin talks about the origins of “taverns” and the important role that they played in the country. It was in taverns where the political future of the nation was debated, Shakespeare’s plays were performed, court was held and traveling musicians performed. During the Revolution taverns served as sites for military trials, prisons and hospitals. Come learn about the drinks of choice in tavers at that time and how they related to our English connection and trade routes. Free for museum members; $10 for non-members. Held in the Heard House of the Ipswich Museum. Winter 2018 Dow Arts Program. Some 6 week-long classes begin the week of January 22nd. The Dow Arts Program offers children and adults hands-on interactive experiences in the visual arts. The program brings together local artists to inspire and teach drawing, painting, photography, crafts, and the study of architecture linked to Ipswich’s historical past. For information on this semester’s classes visit the Dow Arts Program page. Saturday, December 2nd from 10 am to 4 pm: Annual fundraising event for Museum featuring sale of holiday greens, handmade gifts, Grandma’s Attic treasures, art, and silent auction. First floor rooms open for viewing, beautifully decorated by Town & Country Garden Club. Museum Store Open, 12-4pm. Dow prints, books, hand-crafted jewelry, fragrant soaps & sachets, pottery, original art. Brown Bag Lunch on Monday, Nov. 6th at noonEssex Heritage and its influence in the area Speaker: Chief Executive Officer, Annie Harris will talk about the mission of the Essex National Heritage Area and its strong reputation that has been created through public-private partnerships with companies, nonprofits and community leaders. Brown Bag Lunches are held at 12 noon on the first Monday of each month in the Appleton Room of the Ipswich Museum’s Heard House at 54 South Main Street. Ipswich seniors and museum members are free of charge. The cost of non-members is $5. Wednesday Evening Lecture on November 15th at 7:30Neighborhood Walk with Stephanie Gaskins Dow Curator, Stephanie Gaskins takes participants on a sentimental journey, exploring, and reminiscing about a specific Ipswich neighborhood. This is a popular lecture series, with residents of a particular area sharing their perspectives. Free for museum members; $10 for non-members. Held in the Heard House of the Ipswich Museum. Brown Bag Lunch on Monday, October 2nd at noonThe Bull Brook Story Speaker: Chris Wright, past librarian at the Ipswich Middle School and Education Committee member will discuss her research on the Bull Brook site. Brown Bag Lunches are held at 12 noon on the first Monday of each month in the Appleton Room of the Ipswich Museum’s Heard House at 54 South Main Street. Ipswich seniors and museum members are free of charge. The cost of non-members is $5. Wednesday Evening Lecture on October 18th at 7:30 pm The Great Marsh & Climate Change Writer Doug Stewart will explore the Great Marsh’s past as valuable real estate for farming salt hay, its unique success over much of the past century in dodging the nation’s swamp-filling mania, and its uncertain future as sea-level rise accelerates. Speaker: Doug Stewart is a freelance writer in Ipswich who has written more than 60 feature articles for the Smithsonian Magazine. His stories have also appeared in Time, Art & Antiques, Muse and American Heritage. Free for museum members; $10 for non-members. Held in the Heard House of the Ipswich Museum. Family Halloween Party on Friday, October 20th 3-5pm. Join us in the courtyard of the Heard House for old fashioned games, scary stories, a haunted house, costume parade, and more! The cost per child is $5/members and $7/non-members. Caregivers are admitted free. Brown Bag Lunch on Monday, Sept. 11th at noonThe Ipswich River Speaker: Past director of the Ipswich Watershed Association and Ipswich Museum board member, Kerry Mackin will explore the Ipswich River’s role in Ipswich history and the many ways it graces our lives today. Brown Bag Lunches are held at 12 noon on the first Monday of each month in the Appleton Room of the Ipswich Museum’s Heard House at 54 South Main Street. Ipswich seniors and museum members are free of charge. The cost of non-members is $5. Wednesday Evening Lecture on September 20th at 7:30Bringing Castle Hill back to Life Learn how architects, landscape architects and historians researched and collaborated in the restoration of the great estate. Speaker: Susan Hill Dolan, Northeast Region Cultural Resources Specialist for the Trustees of Reservations Free for museum members; $10 for non-members. Held in the Heard House of the Ipswich Museum. Brown Bag Lunch and Wednesday Evening Lecture Series are on Summer Break. Whipple Wednesdays! Every Wednesday morning in July and August, 10am-noon. Join us in the yard by the Whipple House every Wednesday morning in July and August for colonial games. There’s no need to make a reservation or stay the whole time; just drop in. 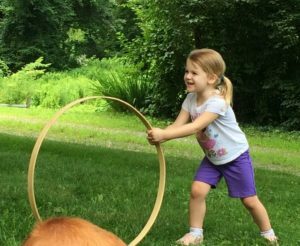 We’ll have a variety of colonial games to play, including rolling hoops, graces, fox & geese, and more! This is a free, all-ages program, but donations are appreciated. Brown Bag Lunch on Monday, June 5th at noonTravel stories from Alaska Museum Educator, Kaleigh Pare will share photos and travel stories about her recent trip to Alaska. Brown Bag Lunches are held at 12 noon on the first Monday of each month in the Appleton Room of the Ipswich Museum’s Heard House at 54 South Main Street. Ipswich seniors and museum members are free of charge. The cost of non-members is $5. Wednesday Evening Lecture on June 14th at 7:30 pm An overview of the summer exhibit with Curator, Stephanie Gaskins. Free for museum members; $10 for non-members. Held in the Heard House of the Ipswich Museum. Friday, June 16th at 11:30 am, The Ipswich Museum invites you to attend our Special Women’s Luncheon. With guest speaker, Ann Velenchik, “Dean of Academic Affairs” and Stand-up Comic whose topic: Schooling for Girls in a Global Perspective will both enlighte and entertain. Enjoy a unique exhibit of embroidered textiles crafted by girls and women in South Africa and South Asia that illustreates the tradtional role of the female in cultures run by and for men. Items on exhibit from Therese Armstrong’s private collection. Lecture begins at 11:30 am followed by lunch at noon. Ann will join us to answer questions. At Boone Hall/Ascension Memorial Church, 31 County Street, Ipswich, MA 01938. Tickets are $75 and can be purchased on this page. Brown Bag Lunch on May 1st at noonNotre Dame, its history and their role abroad Speaker: Sister Leonora Coan works in Development for the Sisters of Notre Dame congregation and will talk about its history on Jeffry’s Neck Rd. and their work around the world. Brown Bag Lunches are held at 12 noon on the first Monday of each month in the Appleton Room of the Ipswich Museum’s Heard House at 54 South Main Street. Ipswich seniors and museum members are free of charge. The cost of non-members is $5. Wednesday Evening Lecture on May 17th at 7:30 pmEnergy Retrofits and the Older Home One of the most challenging issues facing owners of older and historic houses is how to make your home more energy efficient without damaging or compromising its historic architecture and fabric. 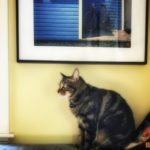 Learn common sense ways to make an old house more energy efficient and hear about recent development in weatherization at Historic New England. Speaker: Sally Zimmerman, Senior Preservation Services Manager, an architectural historian and formerly preservation planner at the Cambridge Historical Commission, which provides technical assistance to old house owners, including help with paint color selection. She is a frequent speaker on period appropriate paint colors, and on energy conservation in old houses and is a co-author of Painting Historic Exteriors, Colors, Application and Regulation. Free for museum members; $10 for non-members. Held in the Heard House of the Ipswich Museum. Brown Bag Lunch on April 3rd at noon Pennacook History Museum Educator, Kaleigh Paré, will talk about and share hands-on materials related to Pennacook, Native history. Brown Bag Lunches are held at 12 noon on the first Monday of each month in the Appleton Room of the Ipswich Museum’s Heard House at 54 South Main Street. Ipswich seniors and museum members are free of charge. The cost of non-members is $5. Introduction to Arthur Wesley Dow Stephanie Gaskins, Dow Curator at the Ipswich Museum will lead adults and teens through the work and life of Ipswich artist, Arthur Wesley Dow, using little seen artwork in the Museum’s collection. An overview of the life and influence of Ipswich painter Arthur Wesley Dow (1857-1922). Dow ran the Ipswich Summer School of Art at the turn of the 20th century. An important figure in the Arts and Crafts Movement, Dow published in 1899 Composition, outlining his theory of art and art education. This book had great influence at the time and is still available today. Participants will also have the rare opportunity to view and discuss objects from the Ipswich Museum’s vast Dow archive. Cost: $30 for museum members and Dow Arts Program instructors. $40 for non-members. Register here today! School Vacation Workshop Wednesday, April 19th, 10am-noonThe Railroad In Ipswich Join us during April school vacation for the science of the railroad! During February school vacation we explored the art and history of the railroad. This month we’ll explore STEM concepts like magnetism, bridge building, and more. 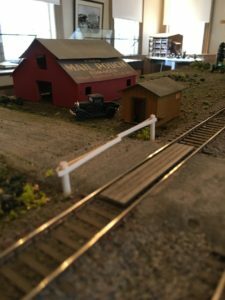 Participants will also get the opportunity to drive the model railroad in the Railroad in Ipswich exhibit before it closes at the end of the month. Suitable for ages 8 through 14. Cost: $10/child Pr-registration is encouraged. To save your spot, email educator@ipswichmuseum.org. Museum. 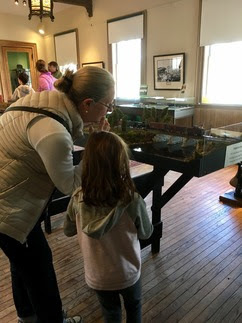 Homeschool Workshop Monday, April 24th, 10am-noon The Railroad In Ipswich Last chance to explore the Railroad in Ipswich exhibit. This month we’ll explore history and STEM concepts (like bridge building). Participants will also get the opportunity to drive the model railroad in the Railroad in Ipswich exhibit before it closes at the end of the month. Suitable for ages 6 though 12. Cost: $5/child Pr-registration is required. To save your spot, email educator@ipswichmuseum.org. March 2017Brown Bag Lunch – Monday, March 6th at 12 noonBehind the Scenes and Landscape Tour of Castle Hill Speaker, Bob Purzycki will do some storytelling and share visuals of Castle Hill. Brown Bag Lunches are held at 12 noon on the first Monday of each month in the Appleton Room of the Ipswich Museum’s Heard House at 54 South Main Street. Ipswich seniors and museum members are free of charge. The cost of non-members is $5. Wednesday Evening Lecture on March 15th at 7:30 pm Renaissance of Railroads: A Perspective on the Last Several Decades of the Industry Darius Gaskins, past president of Burlington Northern Railroad, chairman of the Interstate Commerce Commission, West Point graduate, PhD. University of Michigan in economics, will present this month’s Wednesday Evening Lecture. Free for museum members; $10 for non-members. Exhibit viewing included in cost of lecture. Held in the Heard House of the Ipswich Museum. Homeschool Workshop on March 27th from 10-noon Women’s History Month Explore museum collections and make a mini biography book of an inspiring Ipswich woman for Women’s History Month at the Ipswich Museum! Homeschool Workshops are open to all children ages 6-12 and are held on the last Monday of the month. The cost is $5/child for hands-on history at the Ipswich Museum. To register, email educator@ipswichmuseum.org by Friday,March. 24th. Spaces are limited and registration is required. February 2017Brown Bag Lunch on Monday, February 6th at noonShaken & Stirred: A Short History of the American Cocktail Joseph Carlin, a food and drink historian, will discuss the history of the American cocktail created around 1806 and quickly adopted in all corner of the globe. Wednesday Evening Lecture on February 15th at 7:30 pm The History of the Railroad in Ipswich Allen MacMillan, a retired railroad engineer, will take us on a sentimental journey, when trains were the main mode of transportation in town. Free for museum members; $10 for non-members. Exhibit viewing included in cost of lecture. Held in the Heard House of the Ipswich Museum. School Vacation Program on February 22nd from 1-3 pmThe Railroad in Ipswich Families can join us for an afternoon on The Railroad in Ipswich. Attendees will get to explore the exhibit and drive the trains, make-and-take their own train using recyclable materials, and more! Email educator@ipswichmuseum.org for more information. The cost is $5 per child. Exhibit viewing included in cost of program. Held in the Heard House of the Ipswich Museum. 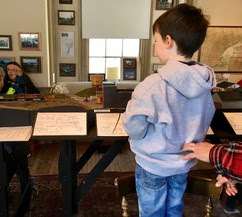 Homeschool Workshop on February 27th from 10-noonThe Railroad in Ipswich Participants will get to explore the winter exhibit, The Railroad in Ipswich and learn about the history of railroads. Homeschool Workshops are open to all children ages 6-12 and are held on the last Monday of the month. The cost is $5/child for hands-on history at the Ipswich Museum. To register, email educator@ipswichmuseum.org by Friday, Feb. 24th. Spaces are limited and registration is required. JUNE – 2016 June 6- Brown Bag Lunch, noon: In Cod We Trust. Speaker: Heather Atwood, author, discusses her cookbook and various ethnic cuisines on the Massachusetts coast, surprisingly as varied as French coastal cuisines. Free for Ipswich Museum Members and Ipswich Seniors, $5 for non-members. 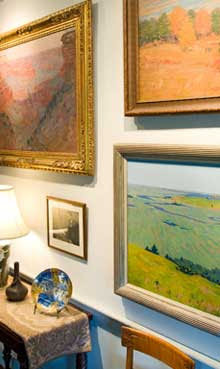 June 15- Wednesday Evening Lecture, 7:30 pm: Overview of Museum’s Summer Exhibit: Henry Rodman Kenyon Impressionist. Speaker: Stephanie Gaskins, Dow Curator and Museum President, will talk about the new summer exhibit of Kenyon paintings. Free for Ipswich Members, $10 for non-members. 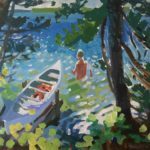 June 17- Summer Exhibit Opening, Henry Rodman Kenyon Impressionist, 6-8 pm.JULY – 2016Wednesday Mornings July and August, Whipple Wednesdays: from 10am until noon each Wednesday during July and August we’ll be hosting a drop-in program at the Whipple House suitable for all ages. Themes will change each week, but each Whipple Wednesday will include a hands-on activity and Colonial games. Suggested donation: $5. Please check back soon for details or email educator@ipswichmuseum.org. MAY – 2016May 2- Brown Bag Lunch, noon:Three Sisters Project.Speaker: Wayne Castonquay, Director of the Ipswich Watershed Association and Chair of the Three Sister Project explains the community farming operation designed to build an all-inclusive sustainable community through food and farm-based engagement. Free for Ipswich Museum Members and Ipswich Seniors, $5 for non-members. May 6- Doo Wop Party, 6-9 pm at the Hellenic Center. Join us for a lively evening of entertainment with the highly acclaimed Northshore Acappella. https://www.youtube.com/user/NorthShoreAcappella Enjoy your favorite music from the 50s through today with light fare, desserts and cash bar. Tickets are $60 per person. Call the office at 978-356-2811 to RSVP. All proceeds benefit the Ipswich Museum. May 11- Annual Meeting 6:30 pmMay 18- Wednesday Evening Lecture, 7:30 pm:Boston Harbor Islands.Discover the new but underpublicized Boston Harbor Islands national park, which has wilderness campsites, a spectacular Civil War fort, remnants of mansions and missile silos, and rumors of ghostly visitations by spies and pirates, all practically within sight of downtown Boston. Speaker: Doug Stewart has written numerous articles for Smithsonian Magazine as well as restaurant columns for the Boston Sunday Globe with his wife, former Ipswich Chronicle editor Coco McCabe. Ipswich Museum Members are free, non-members $10. May 23- May Homeschool Workshop, 10 am to noon: Childhood in the 17th Century. This month participants are encouraged to imagine themselves living their daily lives in the 1677 Whipple House and 17th century Ipswich. Museum teachers identify four basic needs for living in any era: food, clothing, shelter and transportation. Through a tour of the house and four hands-on activities, we explore how children in the 17th century contributed significantly to meeting these needs for their families. We also help students better understand their worlds by examining contrasts and comparisons with the 21st century. Homeschool Workshops are open to all kids age 6-12. The cost is $5/child to explore hands-on history at the Ipswich Museum. Spaces are limited and pre-registration is required. To register email, educator@ipswichmuseum.org by Wednesday, May 18th. May 28- Museum opens for Tour Season!APRIL – 2016Every Sunday from 2-4pm: Come see Properly Seated exhibit, curated by John Fiske and learn who sat on what and why in Ipswich. April 4 – Brown Bag Lunch, noon:Ipswich Reads One Book. Co-sponsored with the Ipwich Public Library, Martha Mauser will facilitate a discussion about the chosen book Station Eleven by Emily St. John Mandel. Copies are available for checkout at the main desk of the Ipswich Public Library. Free for all.April 20 – Wednesday Evening Lecture, 7:30 pm: Why Our Stories Matter. Personal stories influence our lives and telling those stories is important, not just in the form of memoirs but by writing diaries and recording oral histories. Speaker: Thatcher Freund is a journalist in Portland ME and has written articles for the New York Times magazine. His publications include: The Python Trail: An Immigrant’s Path from Cameroon to America and Objects of Desire: The Lives of Antiques and Those Who Pursue Them. Ipswich Museum members are free, non-members are $10. April 23- Spring Clean Up at the Museum, 9 – noon: Meet at the Heard House. Please bring a rake and gloves, coffee and pastries will be provided. MARCH – 2016Every Sunday from 2-4pm: Come see Properly Seated exhibit, curated by John Fiske and learn who sat on what and why in Ipswich. March 7 – Brown Bag Lunch, noon:Did You Ever Wonder What Time Is….Really? Bob Purzycki, Tour Guide manager, explains where the concept of time comes from. By the end of the presentation everyone will really know what time is. Free for Ipswich seniors and members, $5 for non-members. March 16 – Wednesday Evening Lecture, 7:30 pm: Mad For Glorry- USS Frigate Essex. The Salem-built USS Frigate Essex was ordered illegally into the Pacific during the War of 1812 and the ramifications of that in the region for the US and international relations. Speaker: Robert Booth is a native and resident of Marblehead, author of several books, co-founder of the online Salem Historical Society and curator emeritus of the Pickering House in Salem. Ipswich Museum members are free, non-members are $10. November 2 – Brown Bag lunch, 12pm: Museum member Kay Evans presents stories and images from her 2009 trip to Norway. Ipswich seniors and museum members free. $5 for non-members. November 18 – Wednesday Evening Lecture, 7:30 pm: Dow Curator Stephanie Gaskins presents one of her “Neighborhood Walks.” This popular lecture series of features slides of past and current views of streetscapes and the audience-shared recollections and known histories of sites. Our Wednesday Evening Lecture series is generously sponsored by First Ipswich Bank. Cost is free for members, $10 for non-members. November 19-20: Please note the Museum office will be closed for the holiday. Happy Thankgiving! November 28 – Build your own gingerbread house workshop, 10am-12pm: The holidays wouldn’t be complete without a gingerbread house! Our hands-on, no-baking family class will supply each adult and child with all the materials needed to build your own candy decorated gingerbread house. All ages! We suggest adult assistance for children under 8. Cost: $45 per family (this includes everything you need to go home with a completely decorated house). For reservations, call 978-356-2811, email office@ipswichmuseum.org or pay online. OCTOBEROctober 3 – 17th Century Saturday, 11am-3pm: Join us for North of Boston’s 17th Century Saturdays this summer! Tours of the 1677 Whipple House, authentic reproduction 1657 Knight House, and circa 1800 Heard House. $15 for tour of three houses; $10 for tour of one house. October 5 – Brown Bag Lunch, 12pm: Marcia Gray, Recording Secretary of the Ipswich Museum Board of Trustees, shares photos and highlights of her recent trip to Vietnam in July 2015. Ipswich seniors and museum members free. $5 for nonmembers. October 11 – Guided tours end for the season.October 12 – Columbus Day: The Museum office will be closed in observance of the Columbus Day holiday. October 17 – Ipswich Lions Club Chowderfest, 11am-4pm: Restaurants from Ipswich and surrounding communities will serve their best chowder vying to take home the honor of “Best Chowder” by both Judges’ and People’s Choice awards – chowder tasting begins at 12:00 Noon. $10 per person/$30 for families, children 8 and younger free! Over 35 local crafters and vendors, live music, children’s activities and raffles! Event on Ipswich Museum grounds and Town Green. October 21 – Wednesday Evening Lecture, 7:30pm: Susan Hill Dolan, Curator of the Ipswich Properties for the Trustees of the Reservation, will present a lecture detailing intriguing objects from the collections of Appleton Farms, touching on the stories of the Appleton family members along the way. Our Wednesday Evening Lecture series is generously sponsored by First Ipswich Bank. Cost is free for members, $10 for non-members. October 23 – Kids’ Halloween Party, 3:30-5pm: Haunted house, scary stories, scarecrow building, crafts. $7 per child. July 4 – The museum is closed for tours in observance of the 4th of July! July 6 – Brown Bag Lunch, 12pm: Dan Clapp of the 1634 Meadery will give an overview of the meadery and this history of meadmaking. Ipswich seniors and museum members free. $5 for non-members. July 10 – Art Walk, 6-9pm: Downtown Ipswich will be transformed into a sculpture garden thanks to Sculpture in Open Spaces. The Ipswich Museum, The Ipswich Visitor Center at the Hall-Haskell House, and Suzanne Crocker’s Contemporary Art Gallery will host an opening reception. July 11 – 17th Century Saturday, 11am-3pm: Join us for North of Boston’s 17th Century Saturdays this summer! Enjoy spinning by Leslie Wind and other crafts demonstrations on the Whipple House Lawn! Tours of the 1677 Whipple House, authentic reproduction 1657 Knight House, and circa 1800 Heard House. $15 for tour of three houses; $10 for tour of one house. July 25-26 – Olde Ipswich Days: Ipswich Public Library book sale on Museum lawn and Museum Yard Sale. JUNEJune 1 – Brown Bag lunch, 12pm: Local author Doug Brendel speaks about his book series “Only in Ipswich.” The Ipswich Chronicle columnist and author of the cartoon-illustrated “Only in Ipswich” book series will read from his funniest “Outsidah” columns. He will also offer a sneak preview of his upcoming book “Ipswich Unzipped” and have his first two “Only in Ipswich” books available for purchase and autographs. Ipswich seniors and museum members free. $5 for non-members.June 6 – 17th Century Saturday, 11am-3pm: Join us for North of Boston’s 17th Century Saturdays this summer! FREE tours of the 1677 Whipple House and authentic reproduction 1657 Knight House (this month ONLY). Tours of the circa 1800 Heard House are $10. June 17 – Women’s Luncheon, 12pm: Join us for a special Women’s Luncheon featuring “Timeless Style” a fashion show narrated by Sondra Winer of Box-Top Consignment Shop and “A Quick Peek at Ipswich’s Love of Dressing up through the Centuries” a talk and pop-up costume exhibit presented by Katherine Chaison, Ipswich Museum Curator. Under a tent on the lawn of the Heard House. Tickets for luncheon, fashion and ‘pop up’ exhibit show $75. All above plus a behind-the-scenes tour of Museum’s costume collection $150. RSVP required by June 15, 2015 June 17 – Wednesday Evening Lecture, 7:30 pm: CancelledJune 27 – Old Rose Sale, 9am-12pm: The Old Rose Gardens at the Whipple House contain pre-1864 rose varieties, many originally from Ipswich residents’ gardens. Sale will take place on Whipple House lawn. $25 per bush. MAYMay 2 – Ipswich Journey Through Time, 12-4pm: Join us for a FREE community event where history comes alive! Knight, Heard, and Whipple House tours, Ipswich 400th Anniversary time capsule dedication, Knight House ribbon cutting, local food and ale, historical reenactments, live music, art show. Raffle to fund the festivities, the Knight House, and the Ipswich Education Foundation. Rain Date Sunday May 3rd. May 4 – Brown Bag Lunch, 12pm: Judy Anderson, former curator of the Jeremiah Lee Mansion (Marblehead), will present an informal talk on furniture making in Marblehead, with a focus on cabinetmaking. Ipswich seniors and museum members free. $5 for non-members.May 20 – Evening Lecture, 7:30 pm: Scott Jewell, Ipswich Middle School educator and Museum volunteer, presents”The Port of Ipswich.” Learn how the first major industry and transportation system affected the development of Ipswich, from information found in the Ipswich Custom House Records and other documents. Our Wednesday Evening Lecture series is generously sponsored by First Ipswich Bank. Cost is free for members, $10 for non-members.May 23 – Opening Day of seasonal guided tours, 10 am to 4 pm: The Museum will be open for tours from May 23 to October 11. Tours last approximately ninety minutes. Learn more, take a tour – and bring your friends! APRILApril 5 – Special Sundays, 2-4 pm:Easter – no Special Sunday exhibit hours.April 6 – Brown Bag Lunch, 12pm: Martha Mauser leads discussion on “Ipswich Reads One Book”, co-sponsored by the Ipswich Public Library. Free to all!April 12 – Special Sundays, 2-4 pm: Visit the winter exhibit “Intriguing Objects: Volunteer Picks from the Ipswich Museum’s Collection.” Free to members. $7/non-members and $5/seniors.April 15 – Wednesday Evening Lecture, 7:30 pm: Join us as Kimberly Alexander, Ph.D., Adjunct Faculty, History Department, University of New Hampshire presents “The Art and Mystery of Making Shoes: New England Shoe Stories from the Long Eighteenth Century.” This lecture will look at shoes and their place in the history of the North Shore and New England in the seventeenth and eighteenth centuries. Presented in partnership with the Portsmouth Athenaeum. Our Wednesday Evening Lecture series is generously sponsored by First Ipswich Bank. Cost is free for members, $10 for non-members.April 18, Garden and Grounds clean-up, 9-11:30am: The snow has melted and the gardens survived the winter of 2015! Tulip spikes in the gardens at the Ipswich Museum are massing for an invasion of color, thanks Peter & John Messelaar. Check in at the back of the Whipple House or join those already at work. Parking is available at the Heard House, 54 South Main St. Gardening tools and carts are on site – or bring your own favorite tools. Call 978-356-8696 for more information. April 19: ?Visit the winter exhibit “Intriguing Objects: Volunteer Picks from the Ipswich Museum’s Collection.” Free to members. $7/non-members and $5/seniors.April 20: Museum office closed for Patriot’s Day/Marathon Monday. Regular hours resume April 21.April 25, Garden and Grounds clean-up, 9-11:30am: The snow has melted and the gardens survived the winter of 2015! Tulip spikes in the gardens at the Ipswich Museum are massing for an invasion of color, thanks Peter & John Messelaar. Check in at the back of the Whipple House or join those already at work. Parking is available at the Heard House, 54 South Main St. Gardening tools and carts are on site – or bring your own favorite tools. Call 978-356-8696 for more information. April 26 – Special Sundays, 2-4 pm: Visit the winter exhibit “Intriguing Objects: Volunteer Picks from the Ipswich Museum’s Collection.” Free to members. $7/non-members and $5/seniors.MARCHMarch 1 – Special Sundays, 2-4 pm: Visit the winter exhibit “Intriguing Objects: Volunteer Picks from the Ipswich Museum’s Collection.” Free to members. $7/non-members and $5/seniors.March 2 – Brown Bag Lunch, 12pm: Ipswich High School Assistant Principal and former archaeologist Jeff Carovillano will talk about the excavation of a privy site during the Big Dig archaeological survey. Ipswich seniors and museum members free. $5 for non-members.March 8 – Special Sundays, 2-4 pm: Visit the winter exhibit “Intriguing Objects: Volunteer Picks from the Ipswich Museum’s Collection.” Free to members. $7/non-members and $5/seniors.March 11 – Annual Meeting, 7:30 pm: All members invited to attend. Special highlight – overview of our winter exhibit, “Intriguing Objects: Volunteer Picks from the Ipswich Museum’s Collection,” with exhibit curator Stephanie Gaskins. Join us for a fun evening! March 15 – Special Sundays, 2-4 pm: Visit the winter exhibit “Intriguing Objects: Volunteer Picks from the Ipswich Museum’s Collection.” Free to members. $7/non-members and $5/seniors.March 18 – Wednesday Evening Lecture, 7:30 pm: William Sargent, NOVA consultant and author of five books on science and the environment, will present “Islands in a Storm, The Plum Island Story.” This lecture will chronicle the effect of Hurricane Sandy on East Coast Barrier Beaches, using Plum Island as a case study for sea level rise. Our Wednesday Evening Lecture series is generously sponsored by First Ipswich Bank. Cost is free for members, $10 for non-members. March 22 – Special Sundays, 2-4 pm: Visit the winter exhibit “Intriguing Objects: Volunteer Picks from the Ipswich Museum’s Collection.” Free to members. $7/non-members and $5/seniors. March 29 – Special Sundays, 2-4 pm: Visit the winter exhibit “Intriguing Objects: Volunteer Picks from the Ipswich Museum’s Collection.” Free to members. $7/non-members and $5/seniors. December 6 – Holiday Boutique, 10am to 4pm: Annual fundraising event for Museum featuring sale of holiday greens, handmade gifts, Grandma’s Attic treasures, art, and silent auction. First floor rooms open for viewing, beautifully decorated by Town & Country Garden Club. Museum Store Open, 12-4pm. Dow prints, books, hand-crafted jewelry, fragrant soaps & sachets, pottery, original art. Free gift tags with store purchase. December 7 – Museum Store Open, 12-4pm: Dow prints, books, hand-crafted jewelry, fragrant soaps & sachets, pottery, original art. Free gift tags with store purchase. Boutique & Grandma’s Attic items for sale in the China Trade Room. For store information (only), please call 978 500 5805. December 13 – Museum Store Open, 12-4pm: Dow prints, books, hand-crafted jewelry, fragrant soaps & sachets, pottery, original art. Free gift tags with store purchase. Boutique & Grandma’s Attic items for sale in the China Trade Room. For store information (only), please call 978 500 5805. December 14 – Museum Store Open, 12-4pm: Dow prints, books, hand-crafted jewelry, fragrant soaps & sachets, pottery, original art. Free gift tags with store purchase. Boutique & Grandma’s Attic items for sale in the China Trade Room. For store information (only), please call 978 500 5805. December 15 – Museum Store Open, 12-4pm: Dow prints, books, hand-crafted jewelry, fragrant soaps & sachets, pottery, original art. Free gift tags with store purchase. Boutique & Grandma’s Attic items for sale in the China Trade Room. For store information (only), please call 978 500 5805. December 20 – Museum Store Open, 12-4pm: Dow prints, books, hand-crafted jewelry, fragrant soaps & sachets, pottery, original art. Free gift tags with store purchase. Boutique & Grandma’s Attic items for sale in the China Trade Room. For store information (only), please call 978 500 5805. December 22-January 4: Museum office closed for the holidays. Happy Holidays!